How do you listen to music? Find out at the Listening Club. At the end of last season we tried out something new – a ‘listening club’. The idea was to have something a little akin to a book club – a chance to delve into an aspect of our repertoire and explore it more, guided by the BBC’s Dr. Hannah French and, in this first instance, Choir Director Ivars Taurins. As with a book club there was some homework to be done beforehand – some set listening, with the session exploring the pieces and recordings that had been set. With that trial session under our belt we’re now ready to embark on a series of three listening club events over the coming year. The first one, on October 5th, actually responds to a question that arose in that very first session: How do we listen to music? 1) Why, when and how do you listen to music? We’ll be asking whether you engage in passive and/or active listening, as well as talking about listening habits – live concerts, radio and so on. For this first question we’ll be asking you to listen to a work from this season, but not setting a specific recording – it’ll be intriguing to see what everyone chooses. 2) How do you choose the recordings you listen to? What factors decide this for you – price? Availability? Simply the first thing you find on YouTube or Spotify? And are reviews helpful? 3) Can you describe what you like about your favourite recordings? We’ll be looking at what informs your choices and ask what makes a ‘good’ performance. 4) Would you ever listen with a score? What might this add to your listening experience? And, fear not, for this section you don’t need to be able to read music! While the session is led and guided by Hannah, we want it to be an informal and interactive affair. Ask all the questions you want – there are no wrong answers or indeed, wrong questions. The more debate and discussion the better. Our first session was a lot of fun, and it was great (I found) to really dive into the music rather than just let it wash over you, something which I must admit I often do, especially when listening at home. Tickets are just $25 (and you can buy them here) and you’ll be sent the set listening ahead of the event. And if you like this one don’t forget we’ll have two more later in the season – the next looks at the battle for good taste between French and Italian Baroque Music while the last looks at the blurred boundaries between baroque and classical eras. We’ll look forward to listening with you on October 5th! Join us for the Listening Club, October 5th. Tickets are available here. It is rare to find orchestral works from the baroque period that use four horns instead of the usual two. On those instances when it did occur, it was usually to mark a special occasion. It is therefore an honour to be part of the horn quartet in Tafelmusik’s A Joyous Welcome program. To perform this concert on instruments similar to those used in the eighteenth century, we will be playing horns associated with the “noble sport” of hunting. This was a pursuit (pun intended) practised by the wealthy nobility. The costs were significant: not only did hunting require a stable of horses, but refreshments had to be provided for guests, the right clothes were expected, and horn players needed to be employed to signal the unfolding events to those who followed on foot. The fanfares played had specific meanings, and included: Uncoupling the Hounds, The Running, The Cherish when the Hounds are in Full Cry, Breaking Cover, The Call Back, The Death, and The Retreat from the Field. Composers who wished to ingratiate themselves to particular patrons often wrote compositions that included horns and musical quotations from the hunt as recognition of the patron’s status and ability to sponsor the event. For three centuries these fanfares have formed the basis of idiomatic music for the horn, with examples to be found in works from Bach to Mozart, and from Brahms to John Williams. Hunting horns were known by various names: in Italian, corno da caccia; in German, Waldhorn; in French, cor de chasse; and in English, French horn. Nowadays we often use the term natural horns to distinguish them from valved horns, which were a nineteenth-century innovation. Compared to other brass instruments, the horn has one of the largest tube expansions, from the narrowest tube at its beginning to a large bell at the end. Its length is dictated by the key required for the music. For example, in this program, twelve feet are needed for pieces in F, and sixteen feet for pieces in C. Sometimes the length is changed by swapping over a detachable coil of tubing called a crook, but this was a technological improvement that only gradually gained acceptance in the eighteenth century. Prior to that development a separate horn was needed for each key. Both versions will be in use for this program, and the horn section need make no apology for any crooks observed in their ranks! Join us for A Joyous Welcome from Sept 21-24, 26, 2017. Tickets are available here. The instrumental portions of our performances this weekend feature Handel’s last compositions for orchestra, written when the composer was in his early sixties. Handel’s three Concerti a due cori were written as “interval music” for three new oratorios: Judas Maccabaeus (1747), Joshua (1748), and Alexander Balus (1748). An oratorio that advertised the inclusion of “a new concerto” always drew a crowd. In the case of the Concerti a due cori (“Concertos for two choirs”), the works were not only newly composed, but were also a new genre. Scored for two antiphonal “choirs” of wind instruments plus a full string orchestra with continuo, they are grandiose, extroverted works, undoubtedly inspired by the trio of so-called “Victory Oratorios” for which they were composed. All three include reworkings of earlier material: Handel’s audiences would have recognized most of them, drawn primarily from oratorio choruses, so the concertos must have had a certain “medley of great hits” quality. You may recognize the chorus “Lift up your heads” from Handel’s Messiah as the second movement of the concerto we are performing this week. Corelli was among the first composers to write music for the orchestra independent of the opera, the dance, and the church. During a visit to Rome in 1681, the German musician Georg Muffat heard performances of Corelli concertos: “These concertos, suited neither to the church (because of the ballet airs and airs of other sorts which they include) nor for dancing (because of other interwoven conceits now slow and serious, now gay and nimble, and composed only for the express refreshment of the ear), may be performed most appropriately in connection with entertainments given by great princes and lords, for receptions of distinguished guests, and at state banquets, serenades, and assemblies of musical amateurs and virtuosi.” Ideal music, then, for welcoming a new Music Director! It was Corelli who popularized the concerto grosso, based on the popular form of the trio sonata for two violins and continuo, to which is added a four-part orchestra: when the two groups play in alternation a wonderful chiaroscuro is created. The solo or “concertino” trio supplies tenderness and virtuosity; the orchestra provides a rich sonority and solid foundation. Corelli started composing and performing concerti grossi as early as 1670, but only twelve were ever published, and those posthumously, as Opus 6, in 1714. Their publication had long been awaited throughout Europe, providing a model for many composers of the late baroque, but their simplicity, classical proportions, and utterly idiomatic string writing were never entirely surpassed. In a fitting tribute, the anniversary of Corelli’s death was marked for many years by the performance of the Opus 6 concertos in the Pantheon, where the composer was buried. The Four Seasons appeared in Vivaldi’s 1725 publication of twelve violin concertos entitled Il Cimento dell’armonia e dell’inventione, which translates roughly as “bold experiments with harmony and invention.” The Seasons, full of audacious experiments of every kind, were undoubtedly the inspiration for the title. The four concertos are accompanied by four sonnets, giving detailed descriptions of the programmatic elements of the music, which paint a vivid picture of life in the Italian countryside in the eighteenth century. The author of the sonnets is unknown, and it is possible that Vivaldi penned them himself. To ensure that the musicians were aware of the effects they were to create, Vivaldi labelled the various lines of the sonnets to correspond with letters in each of the instrumental parts. He also included very detailed instructions for performance, including dynamics, bowing, and articulations. The concertos are dazzling proof of Vivaldi’s skill as a violinist and his ingenuity and inventiveness as a composer. The sonnet and a page of the solo violin part of Summer from the original 1725 publication. You can see the letters in the part that correspond to lines in the sonnet. We are delighted to be presenting all four concertos over the course of our concert season, with Elisa Citterio as soloist. We begin with Summer, which opens with languid, oppressive heat from the blazing sun, accompanied by bird calls, and finally interrupted by a summer storm. A shepherd, terrified by the storm, attempts to calm himself in the second movement, but is pestered by insects and troubled by approaching thunder. The storm lets loose its fury in the final movement. The full sonnet is printed below. Canta la tortorella e’l gardelino. the turtledove and goldfinch join in song. of the wild squall and anxious for his fate. and the angry swarms of gnats and flies. flattening the cornstalks and the grainfields. Vivaldi wrote a number of concertos with an expanded orchestra, i.e. “con molti strumenti.” The Concerto in F Major is essentially a concerto for violin, but rather than accompanying the soloist with the usual string orchestra, Vivaldi adds oboes, bassoons, and horns to create a work that is colourful and festive. The winds play solo passages in dialogue with the violinist, often stealing the limelight. 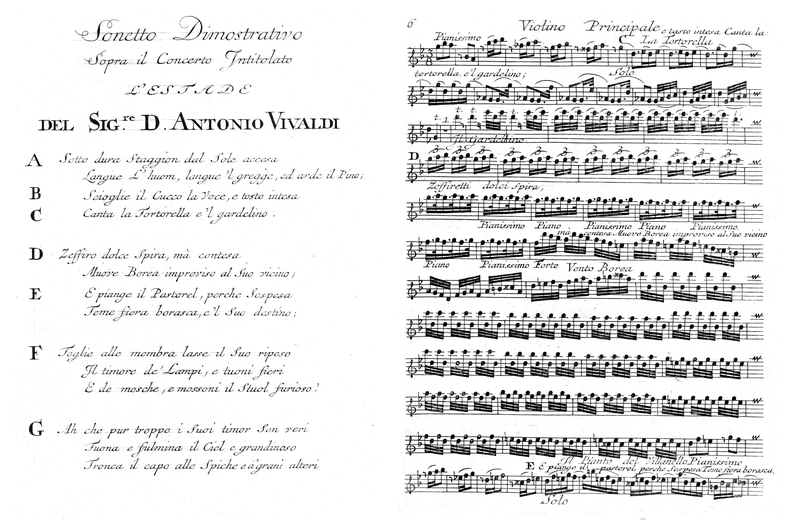 This concerto survives in two versions: Vivaldi’s manuscript score in Italy, and a manuscript score and set of parts copied by the violinist Pisendel at the court in Dresden. Pisendel was one of a small entourage of Dresden musicians who accompanied the Crown Prince of Saxony on a visit to Venice in 1716. Vivaldi was impressed with the abilities of these musicians, and by their accounts of the impressive skills of the Dresden court orchestra, with its legendary wind players. He befriended Pisendel, and sent music to him in Dresden on a regular basis. It is quite possible that many of Vivaldi’s Concertos con molti strumenti were written expressly for the Dresden court, including the concerto we are performing this week. Les Boréades was Rameau’s last opera, composed in his eightieth year. Although rehearsals had begun as early as April 1763, no performance took place prior to Rameau’s death in September of 1764, for no obvious reason. The work was not premiered on stage until over 200 years later, in 1982 (by John Eliot Gardiner at the Aix-en-Provence Festival). It is a remarkable opera — Rameau seems to have summoned all of his creative energy to create one final masterpiece, a work that is surprisingly modern, sensual, and spirited. Like other Rameau operas, it includes a wealth of instrumental music, written to accompany the dance, to cover scene changes, and to provide aural “images” of events and scenes on stage. The splendid overture to the opera introduces the selection of instrumental movements we have chosen to close our concerts this week. Leading up to Elisa Citterio‘s debut as Tafelmusik’s new Music Director, we sat down with Elisa for a short Q&A so we all could get to know her better. Welcome to Toronto, your new home! Did you know much about the city, or Canada as a whole, before your first visit? Thank you! My first visit to Canada was when I first met Tafelmusik in 2015, and at that time I knew nothing at all about either Canada or Toronto. In the past I had turned down many tours of your country because I was too busy with other commitments, but every time I hoped to be able to come as soon as possible. My wishes came true! What do you look forward to exploring in the city? I am so excited about exploring the different neighbourhoods, with so many cultures living together, to discover many kind of foods, and to find green areas around the city. I am looking forward to relaxing walks on the beaches. I’d like also to explore other musical events here. What are you looking forward to performing this year? To be honest, I am looking forward to performing anything with the orchestra, choir, and Ivars! But I am particularly excited to perform with our guests Jeanne Lamon, Bruno Weil, Kristian Bezuidenhout, and Alison Melville. Who are your favourite composers to perform? Bach and Mozart. But I love Monteverdi as well. I have to say that I have also loved performing works by Strauss, Janáček, Shostakovich, Puccini, and Verdi. If you had asked me a couple of years ago, I would have said dancing the tango, visiting with my nephews and nieces, and walking in nature. Now I spend every free minute with my one-year-old daughter. It’s difficult to remember, because my mother organized a few concerts every year with her piano students, and I played every time on both piano and violin. I suppose the first time I probably played a Bach minuet on the piano, and a violin concertino by Küchler. The first professional performance was for the award ceremony of a violin competition: I was twelve and I played an easy Vivaldi concerto. What are the last three recordings you listened to? I used to listen a lot of tango music from the 1940s and 1950s, and also some Italian pop music. certainly bigger, but I think you have many more green areas here. I had also been wanting to have a baby for many years but I didn’t have the time to realize this wish. I am so happy to have my daughter Olivia in my life. Now my biggest ambition is to be helpful to Tafelmusik. There are so many wonderful musicians all over the world, and the list would be very long! Firstly I received a big inspiration from my mother, since she loved music so much — whenever she was home she listened to classical music, and she practised piano for half an hour every night, even after very long days. And I had lessons with so many teachers, and some of them were really inspiring. I can mention four of them: Chiara Banchini, Enrico Onofri, and Luigi Mangiocavallo for baroque violin, and Dejan Bogdanovich for everything. That’s the most difficult question for me at this moment of big change. The next three years will be a great adventure both for me and for my family. Maybe we will all fall in love with your country! Of course, taking care of them and of their wishes for the future is a priority. We don’t have the soccer following that Italy does, but we do have some passionate fans! Do you follow any sports teams? Actually I don’t — I don’t appreciate the big business that surrounds soccer, so I won’t miss it. I enjoy following the Olympic Games, but that’s all. You can hear Elisa perform with Tafelmusik in A Joyous Welcome from Sept 21-24, 26, 2017. Tickets are available here.